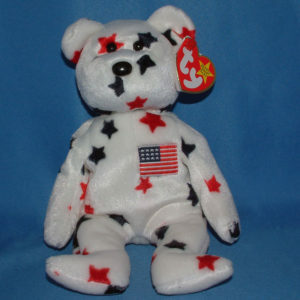 Glory was released in May 1998 to the delight of Beanie Babies fans who were looking for a patriotic USA Beanie from Ty. Prices for Glory bears did elevate as this was the time of huge popularity for Beanie Babies. Today, Glory Beanies are very common and can be had for under $5. Counterfeit versions exist, sometimes featuring a different poem.